Summer Camps are now enrolling! Check out our Classes Page for the details and join the chickens in the garden for lots of summer fun. Small class sizes allow for lots of personal attention. I have several requests for more detailed instructions on the "Fireworks over Seattle Project" so here goes! For a class over 24, each child should get 2 sets of circles and 2 buildings. Do the circles first. When everyone is done, explain and start on the buildings. Allow 1 1/2-2 hours depending on the the age of the kids. I usually do this project with 4 or 5th graders. 1. Have the kids select 3-5 sheets of precut squares of tissue and cut concentric circles. Working lightest/brightest to darkest. Tissue paper is translucent once you apply the glue so keep those dark colors small! Color theory comes into this as well. Do not layer colors complimentary colors. Use orange tissue only with yellows, pinks and reds. Try to keep orange to a minimum. 2. Apply a thin layer of gloss medium with a brush to the canvas or wood surface slightly larger than the first circle. place the circle down and with the sam brush smooth it out so that there are no air bubbles. Brush gently, do not scrub. Tissue paper tears easily. tissue paper also bleeds so have the kids brush with the shape of the circles as they putting them down not across the circles. 3. Overlap around the edges and with the other circles so that there are no white spaces showing. cover cover about 2/3rds of the board. 4. Using pencil crayon draw in your skyline. Have all the building shapes precut from at least 3 different papers so that there is a bit of variety in the color, white to off white, cream even pale grey. Card stock is to heavy, thinner is better. Cut the main buildings in the skyline and then more rectangles in a variety of sizes. 5. Draw a few examples of patterns to get them started. I even have them practice a few before they get started. They usually really get into it and just start doodling. Have them select a building and cover it in pattern with sharpies. I have them pick with a thick or thin sharpie. I also ask them to hide their names or a message within the pattern. The patterns are abstract and not drawings of the buildings. 6. Attach the buildings in the same way as the tissue. Gloss medium first, then brush the building into place making sure its well attached without air bubbles. For a class over 24, each child should get 2 sets of circles and 2 buildings. Do the circles first. When everyone is done explaining and start on the buildings. Allow 1 1/2-2 hours depending on the the age of the kids. I usually do this project with 4 or 5th graders. 7. When its finished, give it a few more coats of medium letting each layer dry. Ms. Wilder's fifth grade class's collage; the background is layers of tissue paper. Students chose a state and wrote about what they would like to change in America. They added a monument, logo or drawing of something that reminds them of America. The final piece is coated in a layer of melted wax covering the entire surface. 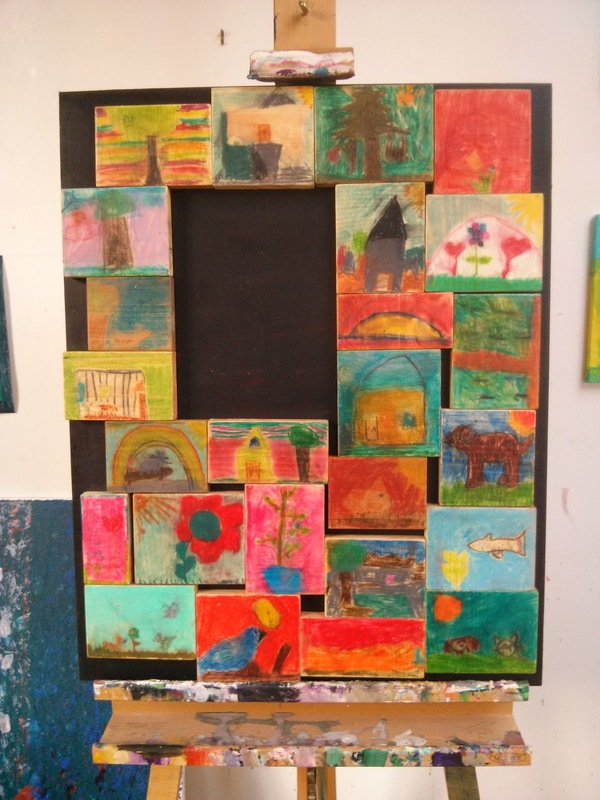 We used acrylic gel medium to collage all the papers to the wood surface. Tissue paper is in the background. Colored paper for the states. Use colorful gel pens to write with NOT pencil crayon or crayon, its just not bright enough. I outlined the states with colorful, bright sharpies so they would stand out. The kids traced or free drew the "emblems' onto vellum with sharpies and then cut them out. The vellum is translucent so the tissue paper show thru when its attached. I put a layer of wax over the entire piece. Ever waxed a snowboard? I keep an old iron, set up a messy area outside, press a block of parrifin wax to the hot iron and let the liquid wax drip all over the piece. Once you have a a nice coating over the whole piece you can iron the dry wax if its to thick in parts and smooth it out. SOme of the papers will absorb the wax creating some deeper , interesting sections in the artwork. 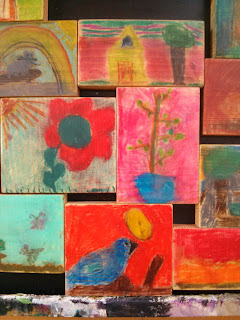 Chalk drawings by 2nd grade students on wood. More melted wax to seal in the drawing. I added a small mirror and a wood frame! 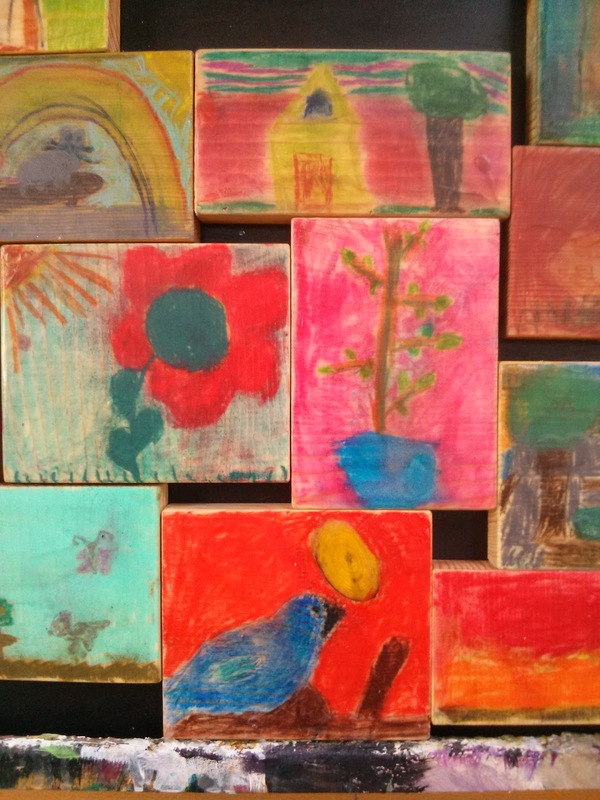 Wood relief sculptures in the style of Louise Nevelson. Decided on white instead of black to emphasis the play of shadows. Its not in the picture, but I had a parent make a lovely simple wood frame for this. I find it a really striking, large, modern piece that was totally a result of the kids creativity!